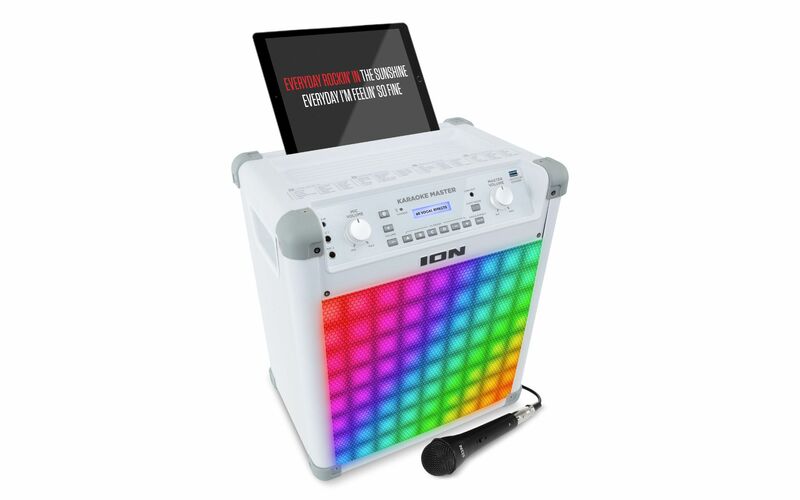 Karaoke is sure-fire fun at any party, but ION’s Karaoke Master brings that fun to the highest level. That’s because Karaoke Master isn’t just any karaoke system. It’s a 100-watt powerhouse with 60 exclusive vocal effects built in that add the perfect touch to any vocal performance. Add dramatic reverb, sound like a Pop or Rock Star, Rap artist or even alter your voice to sound like an evil robot, Darth Vader or a Munchkin. It’s endless supercharged fun, unlike all the other low-power karaoke machines out there. Its voice correction processing in auto-tune mode ensures you’re always in tune, and the ultra-long-lasting 5Ah rechargeable battery means the party never ends. This rugged speaker streams your favorite YouTube karaoke music from any Bluetooth device and pumps out great sound through its 8-inch 2-way speaker and powerful 100-watt amplifier. Its built-in sound-reactive, colorful LED lights—with multiple display patterns—deliver great visual effects that turn the ordinary into the extraordinary! Combine its vocal effects, high power, exciting lights and long-lasting battery with a convenient USB charge port to recharge your devices and it’s obvious that the Karaoke Master is in total charge of your party!